Starting off in Yurakucho, exploring Ginza and ending in Shimbashi, your guide will show you the sights, sounds, and most importantly, tastes of Tokyo most tourists do not get to experience. Visit Gado Shita, a lively restaurant district built up under the brick arches beneath the elevated train tracks. Step into the narrow streets of the red lanterns and neon signs, so called yokocho alleys, where you can find yourself back in the 70s of Japan. In such exotic and retro ambience of the Showa period times, you’ll see local izakaya mostly frequented by locals. You’ll enjoy 2 food stops in this area that serve typical snacks/ starters enjoyed by local Japanese office workers and friends out for a night on the town. Enjoy traditional starter- bar snacks in one spot, and discover the regional tastes of Ise in Mie Prefecture at another quaint and interesting location. Travel back in time to 1970s-era Japan as you explore the maze of eateries in the unique and interesting Gado Shita. Stroll the streets of Yurakucho, Ginza and Shimbashi with a professional, local guide. Experience the extreme range of these areas from posh Ginza, to the office worker havens of Yurakucho and Shinbashi. The All Star tour is one of our longest running, most popular and highly rated tours. 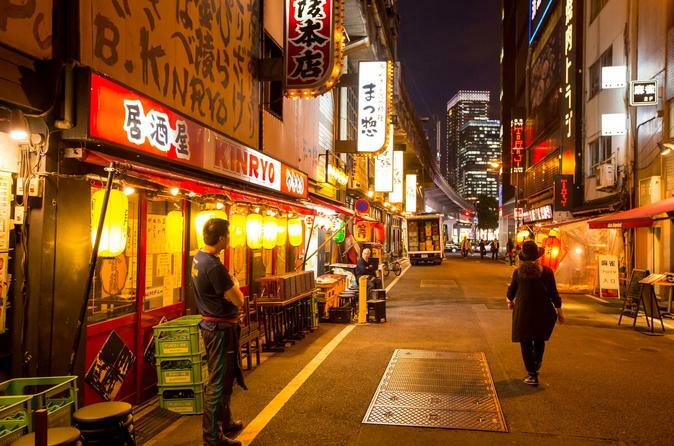 Starting off in Yurakucho and ending in Shimbashi, your guide will show you the sights, sounds, and most importantly, tastes of Tokyo most tourists do not get to experience. Visit Gado Shita, a lively restaurant district built up under the brick arches beneath the elevated train tracks. Step into the narrow streets of the red lanterns and neon signs, so called Yokocho alleys, where you can find yourself back in the 70s of Japan. In such exotic and retro ambience of the Showa period times, you'll see local izakayas mostly frequented by locals. You'll enjoy 2 samplers and a drink. The second stop is a very good local spot hidden in the back streets of Ginza where you'll sample 3 seasonal skewers and udon. This udon is a regional specialty from the south of Japan and a must try! You will also get a second drink here. Continuing in Ginza, explore some very interesting food spots where you can find a $400 melon, and a famous Sembei (rice cracker) shop dating back from the early 1800’s! Taste for yourself the tradition and pride behind this tokyo historic spot– their secret recipes have been guarded carefully for over 200 years. See the famous landmarks of Tokyo’s most expensive real estate area! Soon after we will go to a special restaurant where we will sample 6 or more regional foods from the south of Japan, in Miyazaki Prefecture. You will also have a chance to experience some amazing seasonal dishes at this place. Finishing up with our last food stop for dessert and then wandering over to Shimbasi you can see how the glamorous ginza clashes with the rustic old Tokyo. Shimbashi is home to some of the most authentic local eateries and izakayas in Tokyo. Have the chance to dine with locals for an evening you’ll surely never forget. This tour is an equivalent of an actual dinner, you will be full and extremely happy at the end of the night!